Shahid's mother and to-be grand mother Neelima Azim says that she had guessed that Meera was pregnant much earlier and had even told Shahid about the same. Becoming a grandmother is the biggest thing that can happen to a mother and clearly mum Neelima Azeem is on cloud nine as well after she came to know that her dear son Shahid is all set to become a father! While there were speculations about Mira's pregnancy, Shahid just recently confirmed that he is going to be a father at the press conference of his new film Udta Punjab! "I had guessed it much earlier"
However, Shahid's mother and to-be grand mother Neelima Azeem says that she had guessed that Meera was pregnant much earlier and had even told Shahid about the same. “Of course, Shahid had told me at the right time, but I guessed it much earlier. Call it a mother’s intuition or sixth sense, but I was pretty sure Mira was expecting earlier. I was extremely happy when Shahid confirmed what I was thinking,” the actress said in an interview to a leading daily. “It’s a great feeling becoming a grandmother and very difficult to express in words. We are all feeling so thrilled, excited and yet emotional... It’s a happy time for us all,” said an excited Neelima. 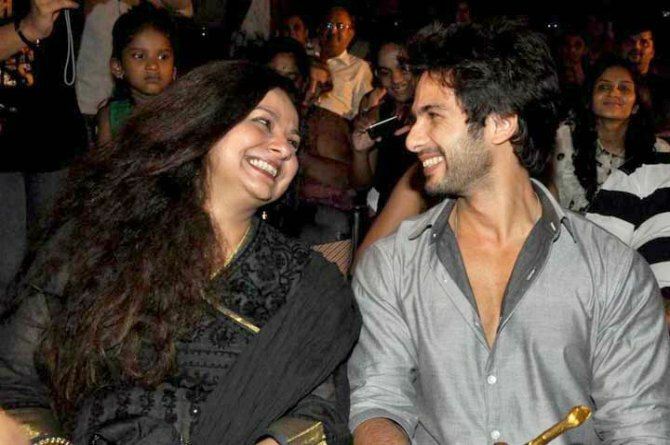 Just like any other mother, Neelima feels that her son Shahid would be a wonderful father and "the world’s best dad". She is really looking forward to being a granny and is not particularly hoping for a grand-son or a grand-daughter as such. “I just want the baby to be happy, healthy and fine... Whether it’s a boy or girl doesn’t matter,” she says. Neelima Azim has another son Ishaan Khattar from her second marriage to Rajesh Khattar. Shahid is her son from her first marriage with legendary actor Pankaj Kapoor. Reports say that Mira is due in early October this year and the couple are really looking forward to the baby.